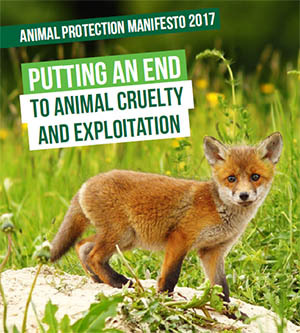 "We now have a new policy that officially acknowledges the sentience of animals and their right not to be abused"
Emma Randall, Animal Protection PWG Manager Oct 2018. Our actions should take account of the well-being of other nations, other species and future generations. We should not pursue our well-being to the detriment of theirs. 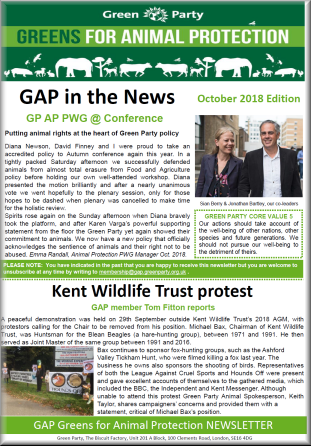 "Putting animal rights at the heart of Green Party policy"
Greens for Animal Protection (GAP) is a Green Party initiative which aims to develop policy on animal protection issues and also campaign for animals. All members of the Green Party are entitled to be full members of GAP. Non-Green Party members are also very welcome to support us in campaigns. Only Green Party (full) members have voting rights at meetings and the AGM. Click here to find out more about GAP and how you can help animals. Click on the heading above to join the Green Party. If you are already a member of the Green Party you can find information about joining GAP on the Green Party member's website.